Materials: Reclaimed, Washed and Shrunken Vintage Damask Fabric. Looks to be a Rayon Cotton or Linen Blend. Back in Textured, Variegated Silk Fabric Remnant. Loop Fringe, Zippers. Visual: 12” x 18” approx. 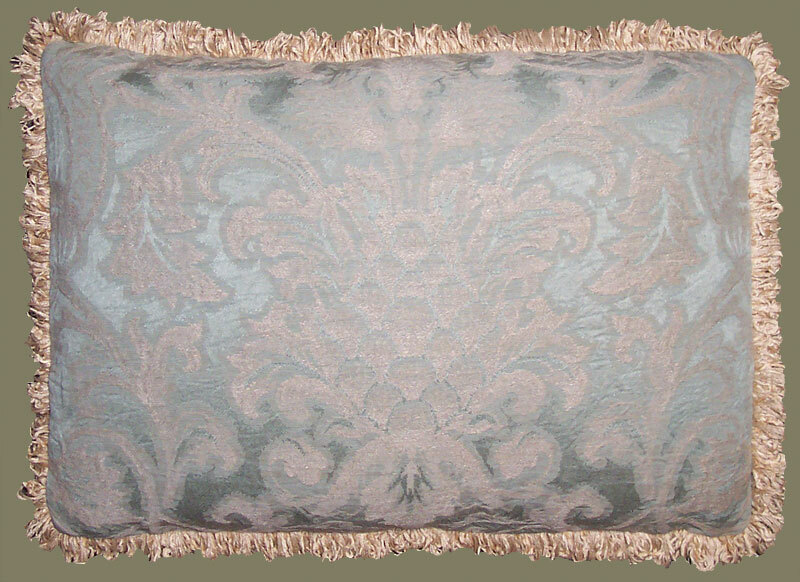 Description: An Artisanaware Decorative Pillow Cover Which Evokes a Feeling of Olde World Europe. Made of Vintage Damask Fabric in Soft, Muted Aqua, Almost a Robins Egg Blue, but with a Dash More Green. The Pattern Being High Lighted in a Light Wheat Color. Shrinking of the Fabric has Produced a Nice Crinkled Texture to this Vintage Fabric which was Rescued and Reclaimed from the Back of an Old Upholstered Settee. The Textured Silk Pillow Backing Fabric and Welt are also Reclaimed Designer Fabrics. Looped Fringe in a Variegated Wheat Color. Zippered. Insert Not Included. A Nice Sized Throw Pillow Cover to Combine With Companion Pillows Offered, and Center in a Classic Olde World Sofa or Settee. Please Inquire About Custom Feather/Down Pillow Insert.